I can only imagine what it was like to discover Bob Dylan for the first time in the 1960’s. But at Jack Savoretti’s gig at the Hotel Café this week, the 23 year old British, Italian singer songwriter performed mesmerizing folk lyrics of evocative travels and lovers lost to an audience, privileged to experience a rare talent indeed. Jack Savoretti has many stories to tell and from the moment he steps on the stage he takes us on a journey across the world through Jack’s eyes. He is a novel that must be read. It is no exaggeration or misappropriation of words on my part to tell you that he is undoubtedly the Bob Dylan of the 21st Century. 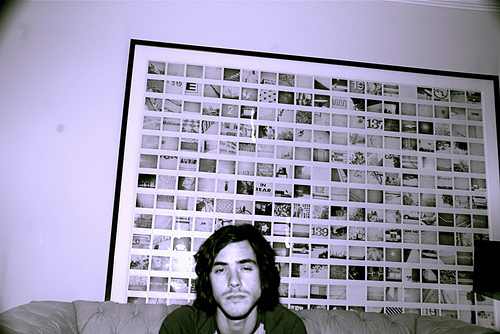 Jack Savoretti is based in London. His English mother was a model in the sixties and his father, Italian. He was schooled in Switzerland and traveled extensively with his family throughout Europe. His observations, intelligence, and compassion are omnipresent in his lyrics. He picked up the guitar at sixteen years old and turned his poems into songs. After playing the circuit in Britain, he was signed by De Angelis Records and his debut CD, Between the Minds, was released in the UK to critical acclaim. He recently toured extensively with Gavin Jack on a 12-tour date around Europe in November and his music has appeared in One Tree Hill and the Sisterhood of the Traveling Pants 2. I caught up with the Jack the night before his LA gig and at the end of two weeks of recording his new EP with band members of the Counting Crows and Motley Crew. Jack Savoretti: It’s traveling music and story telling. Each song is a song in itself and a journey. Tell me about Between the Minds? How personal and true are your lyrics? J: Between the Minds is a patchwork of tombs. They are experimental songs that are connected together. What is fact and fiction is a mish-mash of experiences. It’s generous for people to call it poetry. They are observations. You grew up traveling around Europe. What was that like? J: My parents have been my walking stick. They love music and always had a great appreciation for great songs. My father listened to Italian music and my mother to Motown; both genres are raw and emotive. We listened to a lot of Johnny Cash and Christopher Cross. My family traveled a lot when I was growing up. We lived in Switzerland and my school was full of international students and I learned about different cultures. Switzerland is a wonderful place to live. What has been the response to your music in the USA and in Europe? Has it been different? J: It’s been good everywhere. I have a certain sound that America feels comfortable with and has the time for. Britain is more about bands but I’ve had amazing experience in London, Manchester, and playing in Glasgow was like a dream. I live in Portobello in London. It’s a great place for musicians and has a vibrant singer songwriter community with plenty of open mic venues. J: Songs can be a gift and music should always be fun. I listened to Joan Baez, Foreigner, Paul Simon, Jackson Brown, and Bob Dylan. Tell me about last months European Tour? J: I love touring and I love the people I’ve met along the way. Touring Scandinavia was a wonderful experience because I’d never been to Stockholm or Oslo. I supported David Degraw. We also played in Germany, France, and Italy. What was your favorite moment on tour and which venue has been a stand out night for you. J: The Heineken Music Hall in Amsterdam with David Degraw and 6,000 people. J: I love performing the new songs. I’m a big believer in playing songs before recording them. The songs are raw and I practice them on the road. I keep the ones that are rememberable. I don’t like overplaying songs in the studio. Between the Mind was recorded as the first draft of my songs. What will your fans expect at a Jack Savoretti show? J: The Hotel Café is an intimate and laidback venue. I don’t talk a lot between songs but I like to try out the new ones. Lyrics are key to a song but it’s the melody that people remember. You can’t have one without the other. When I’m away from home, I write a lot. Being homesick is fuel for my music. When you’re not playing music, what else makes you tick? J: Football is almost as important as music. Ha. I support Aston Villa in England but for the World Cup, it’s Italy. When we won the cup in 2006, it was the happiest day of my life. English-Italian, singer songwriter, Jack Savoretti plays LA’s Hotel Cafe Wednesday night at 10 pm. He’s been compared to Ben Harper, Bob Dylan, and Neil Diamond. He’s just finished a European tour and his music has appeared on One Tree Hill and Sisters of the Traveling Pants 2. At 23 years old he’s on the cusp of international stardom. I caught up with him today to talk about music, traveling, and football (soccer). My interview and concert photographs will follow.